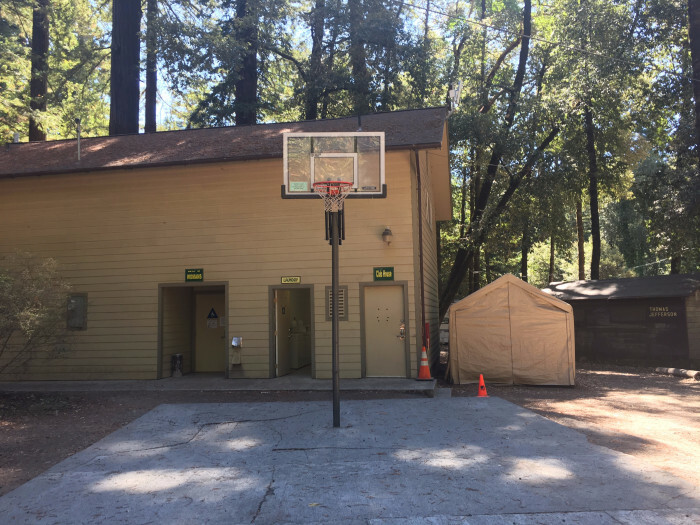 Ask fellow campers about "Redwoods River Resort" and nearby attractions. We enjoyed this campground so much we stayed here twice on our trip. Once on our way up the coast in August and then again on our way back down in September. The setting and atmosphere is amazing! Camping under the giant redwood trees was unforgettable! It was so dark and quiet at night. We enjoyed campfires and stargazing. The roads around the campground were easy to navigate, even in a large motorhome. We stayed in site #11 (RV Site) in August and site #48 (RV Prime Site) in September. Both sites were great. Site #11 was a pull-through and easy to get in and out of with lots of round around us. Site #48 was a very private, premium back-in site. Site #48 was my favorite! It felt secluded with lots of tall redwoods around us and the river below. We have a 38' class A motorhome and had no trouble getting in and out of the site as well as around the campground. The campground provides 250MB of date for your stay. You can purchase additional data (1GB $5; 2GB $10; 5GB $25). The internet was great. We were able to stream our Apple TV on it with no problems. We had trouble get our Dish TV satellite reception because of all the trees. We did not have any T-Mobile cell service; however, WiFi calling worked over the internet. The on-site restaurant/pub was so convenient and the food and drinks were great. The owner was there and was so friendly and welcoming. The office staff was always very pleasant and helpful with purchasing firewood. Overall it was just a great atmosphere and we really enjoyed our stay. It felt like true camping, but with full hook ups! We camped at Redwoods River Resort in a Motorhome. Definitely take the Avenue of the Giants! We were concerned it wasn't doable in our 38' Class A motorhome; however, it wasn't a problem. One of the highlights of our trip! Stayed here weekend before the 4th. Very crowded with many sites doubling up with friends. Dusty dirt roads. Lots of late night partying. Voltage is low could barely use our microwave. Could not use A/C due to lack of power. Would not give us the Good Sam discount due to prime time. It's a good location and we needed it so we stayed. If you're into camping under the giant redwoods this is OK. Close to the south end of the Ave of the Giants scenic drive. 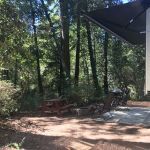 We camped at Redwoods River Resort in a Travel Trailer. Glass beach in Ft Brag and a car/truck drive south on scenic CA 1 is a must. Don't take a motorcoach or large trailer! Ave of the Giants easy drive north. Again, not recommend for big rigs. Rustic camping among the redwoods Check in slow , wifi slow , no cell phone coverage. We camped at Redwoods River Resort in a Motorhome. You'll camp beneath the redwoods. This isn't a large park, but it does accommodate campsites, motorhome sites, trailers, rental cottages and lodge rooms. This is an older park that is hard to locate. It attracts family gatherings and is more rustic than modern. The staff are friendly and helpful. The swimming pool was packed with kids having a great time as was kids at "Fort McCaffison", an elaborate, 2-story fortress-playground. There is no off-leash dog area, but there is plenty of wooded areas to walk your dog. The sites are large. On one side of the park you'll get some road noise from scenic 101, on the other you'll be where the cliff drops hundreds of yards to the river (there's a fence behind the RV sites). The "350" yard trail to the river is steep. It wasn't going down that worried me as much as struggling back up. Near the park is a mostly paved road that goes to the river the locals can direct you to. The Pub is small and cozy with friendly campers hanging out. We started out staying for two days and decided to lay back under the redwoods for an extra day. 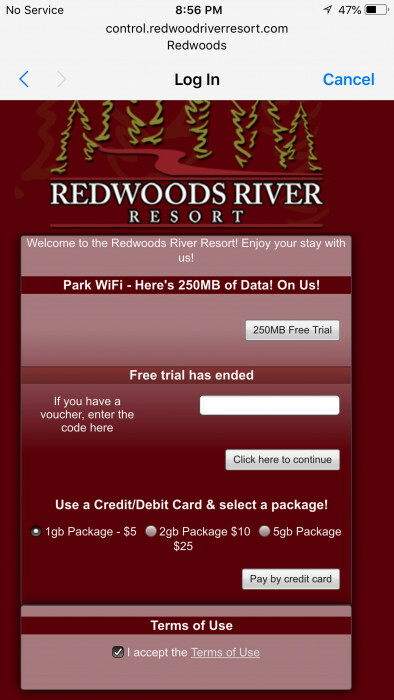 We camped at Redwoods River Resort in a Motorhome. Visit Avenue of the Giants (redwoods), and be sure to drive through the state park. You start out through an area that is not the actual park. There are several small towns the road used to connect, most with local restaurants and shops. Nice campground in the Redwood trees next to the river. Under new management, staff was very friendly and helpful. This was a one night stop, but got a good pull thru site with our Motorhome and tow car. We camped at Redwoods River Resort in a Motorhome. Nice campground with redwood trees in your camp site. Lots of different sized sites, but they had sites large enough for our 38' 5th wheel. Sites are all dirt with a fire ring and picnic table. Staff were very friendly and helpful. The little store was nicely stocked with essentials. There is a steep trail that is about 350 yards long down to the Eel river, but it is worth the effort to see the river. Entrance to the campground is directly across from Confusion Hill, a little tourist attraction. No AT&T signal here. The park does have wifi, the first 50MB is free (per device connected) and then you are prompted to pay on the device $5 for 1GB. The wifi is slow and does not support streaming, but was adequate for checking email or searching Google maps. The 50 amp electrical connection was strong, but the water pressure was very weak. We stayed 3 nights and on the morning of our departure I started dumping the black tank. My neighbor came over and asked me to stop dumping because water was coming out of his sewer connection and flooding under his rig. The septic system was clogged or full and the campground owner had to call a septic service. We waited over an hour but needed to get on the road and I eventually just had to leave without being able to dump my tanks. Hopefully this was just a fluke issue. We would probably stay here again. We camped at Redwoods River Resort in a Fifth Wheel. Camping under the redwoods is spectacular. 2 trails from the campground down to the Eel River are very strenuous but worth the effort. Wi-fi is fee based. More space between sites then most places we stay. Some effort to level out trailer was required, most spaces seem to have good access and were fairly level. Cell phone coverage with Verizon was 3G. 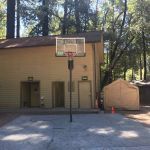 We camped at Redwoods River Resort in a Travel Trailer. We were here in the "Off" and "Rainy" season. It rained every day! Sites and roads are dirt and MUDDY! This park has not seen an upgrade in years! Family owned and operated. Redwoods are in your site! People are VERY HELPFUL and nice! There is a bar and restaurant on site with some food. The trail to the river is a long straight up and down path about 1/4 mile. You need to be ready/able for it. 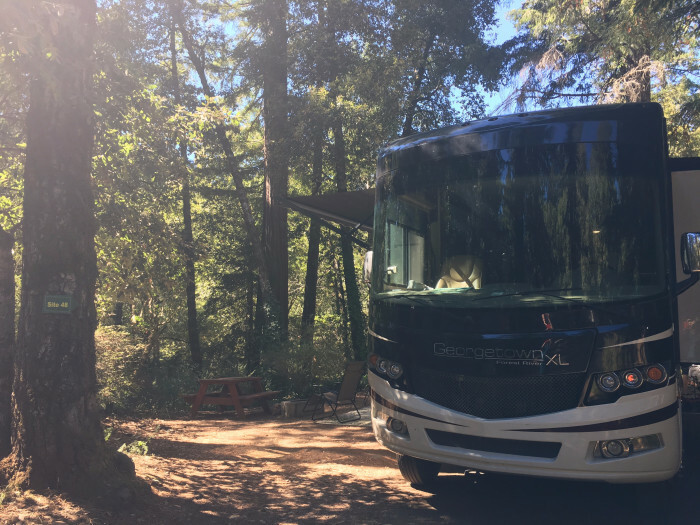 We camped at Redwoods River Resort in a Fifth Wheel. This campground is ok. We had a premium site which was not really worth the money, but it was away from all the hubbub of the park. This park is on the river but the walk to the river is very steep and they refer to it as the huff and puff walk. You can't see the river from the campground. The employees were very nice. It was also very dry and dusty. We won't go back, but if you want to use it as a base camp get a cheaper site and you'll be fine. We camped at Redwoods River Resort in a Motorhome. We loved staying at Redwood river resort. It is a smaller campground, but still had some nice events. Ice Cream social was very nice. The sites are large. The trek down the 300 yard trail to the Eel river is STEEP, but worth it. You can swim/float, walk over to a deep swimming hole with a rope swing. We booked again. The biggest PLUS of this location is that you are camping IN THE REDWOODS. It may be a bit pricey, but there is nowhere else you are going to do this. The nearby KOA in Benbow is on a flat plain with no shade! I didn't hook up my TV, so I don't know/care if it worked. Wood prices were reasonable and the staff was great. 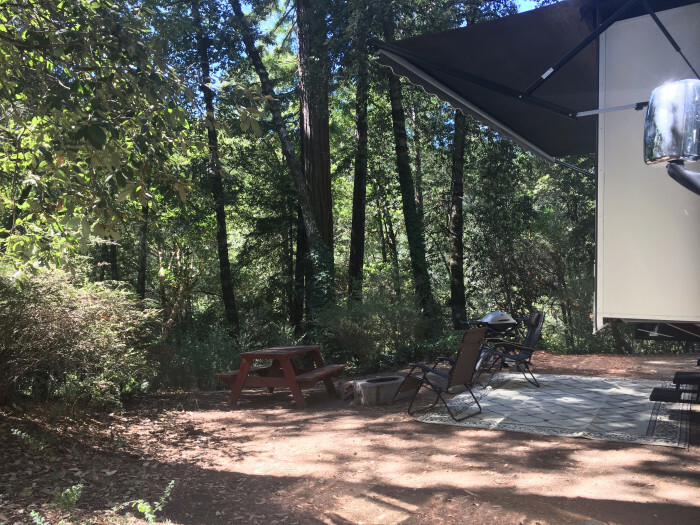 We camped at Redwoods River Resort in a Fifth Wheel. Garberville is north of the site. The trip through the Avenue of the Giants is, imho, the number one place for Redwoods in CA. As someone esle noted, your GPS won't find this place. It is ACROSS THE STREET from Confusion Hill. Rustic, old, in need of major renovation. Close to Hwy 101 and truck traffic. They are completing a new pub and awaiting liquor license. Most cabins and motel type accommodation buildings really showing age. One restroom/ bathhouse was closed. Satellite TV at most sites non existent. Verizon cell very week. Some large sites. Most sites are heavily shaded by tall redwood and oak trees, pretty level and more dirt than gravel. We were told we would have 50 amp but when we arrived they said none available. Water pressure good. Friendly staff. Quite a distance to any real shopping or grocery. Campground store does have basic supplies. Wifi $, no cable or over the air tv reception. I got 4 FM radio stations. Spent 3 nights. Won't stay here again. We camped at Redwoods River Resort in a Motorhome. First, the park is very hard to find. The address does not match up to our GPS. We drove by it the first time. Poor signage. If you are going to the site it is next to confusion hill. Signage is poor and you come up on it quickly. The entrance is on a curve.The pads are gravel and not as level as it should be. The only thing really going for the park are the wonderful Redwoods that are around the park. We would most likely not stay there again. The price was not worth the location. We camped at Redwoods River Resort in a Motorhome. A nice park amongst the redwoods, however pricey for what you get. Why do places charge extra for pets - $2.00/night. Charge extra for Wi-Fi - $4.00/night/device. In my opinion the owners are just squeezing as much money as possible. On the Wi-Fi, the bandwidth was terrible. They charge and don't deliver. I also didn't like the aspect that they ran electrical conduits up the old trees and installed hookups. Also had a satellite dish fastened to a tree for a nearby permanent camper. All in all, not a pleasant experience. I would avoid it. 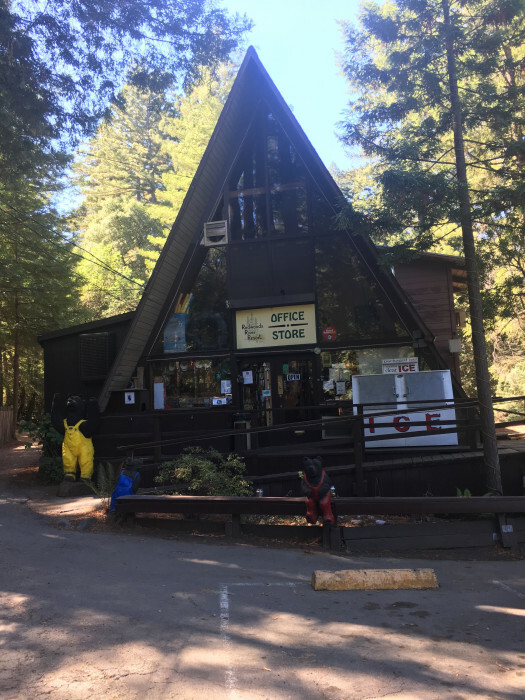 We camped at Redwoods River Resort in a Motorhome. This is a 10 as a campground but very average as an RV Park. The setting is spectacular among the redwoods. There is plenty of space to maneuver big rigs. But you will be short on amenities. It is almost impossible to get satellite TV and there is no cable. The 30-amp electricity often fell below 110 volts. The wifi was expensive and inconsistent. On the plus side full hookups are available. The park is not near restaurants or supermarkets but there is the Pacific Coast Highway to the south toward Fort Bragg and Redwood State Park to the north. 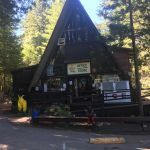 The closes small town is Garberville which bears the title of “marijuana heartland of America.” We camped at Redwoods River Resort in a Motorhome. 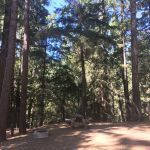 We were pleasantly surprised to find an amazing campground where we could actually camp among the giant Redwood trees. The park was extremely clean, quiet and beautiful and the staff could not have been more accommodating and friendly. We had several Redwood trees right in our large pull-through site. The grounds were beautiful and you can hike down a moderate trail to the Eel River with a great little sandy beach. We will definitely be returning again soon! 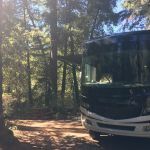 We camped at Redwoods River Resort in a Motorhome. 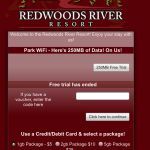 Are you affiliated with Redwoods River Resort ?